I'm long overdue for a run through new and recent releases and I've a got a great collection of songs that range from pop to pomp and a couple with some rough edges too. Tiddabades are a Wellington band who have made the final 20 of the MTV 42Unheard competition for new and upcoming bands. They've released a self-titled track EP which you can buy through their myspace page. The songs, which have nagging little guitar lines and a vocal style Real Groove magazine described as "the barked, recorded-into-a-computer-mic variety", pretty much follow the same formula but when they hit the mark like they do on 'Colours' they're a lot of fun. Visit the MTV 42unheard competition website to vote. The Brunettes fourth album has just come out on Lil' Chief Records and although nothing jumps out like 'Brunettes Against Bubblegum Youth' did on the last album, Paper Dolls is full of sweet pop songs written, performed and produced by Jonathon Bree with vocals from Heather Mansfield. What gives The Brunettes longevity is that their songs are carefully constructed and have a sense of melancholy that counterpoints all that sugar. If you purchase the album through the Lil' Chief site they'll also throw in The Red Rollerskates EP. 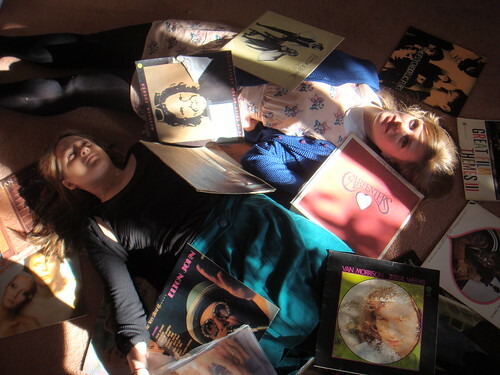 Go to the myspace page of The Gladeyes, a two piece from Auckland and the background image is of Jade Farley and Gwen Norcliffe lying on the floor amongst their favourite albums. I was heartened to see that amongst records by the likes of The Carpenters, Elton John and Van Morrison, there's also a solo album from former Velvet Underground drummer Maureen Tucker, the excellent Life in Exile Following Abdication. That album is indicative of the fact that The Gladeyes like a little bit of grit amongst their saccharine sweet folk/pop, also borne out by decision to cover Dunedin punks Die! Die! Die! on their debut album Psychosis of Love. The Gladeyes are labelmates of The Brunettes - Lil' Chief has a strong stable of indie-pop and is one of that handful of labels where if you like one thing you will probably be safe buying anything they out. There is a clip for the song 'Bad Town Blues' by The Gladeyes on the video page and take a look at their blog. Yet more sweetness from The Sing Songs. I've been a fan of this band for a while, singing their poppy songs with suprising lyrics, like HTML - about writing website code, or Pamphlet Baby (included in the May Music Alliance Pact) - about a woman mourning the child she lost before birth. The Sing Songs have now collected together the songs they've had floating around the internet and recorded and released them as an EP Sing Five Songs. I've especially enjoyed the one song I hadn't previously heard - this one about Facebook - 'Previously We Were Friends'. Okay, enough sweetness. The Postures claim to have been raised on pies and heavy metal and have recently been touring with the likes of Mountaineater. They make about a million times more noise than The Gladeyes. 'Poor Impulse Control' is a taster of a forthcoming EP. There's a live clip of The Postures on the video page. Finally is Hamilton outfit Date/Month/Year. I say outfit because they swear black and blue that they're not a band although I don't see what all the fuss is about - what's wrong with being a band. However you can read their lengthy explanation on their blog. Date/Month/Year's fourth self-released album Pot/Kettle/Black is out now. No matter what you call them they're a talented bunch of musicians with a powerful and talented vocalist in Emma Koretz. The album's an eclectic collection of tracks ranging from moody soundscapes to classic pop and huge swelling Pro-tool powered epics. Date/Month/Year say it is a concept album dealing with the mundanity of modern life (or maybe just Hamilton?). I would also recommend going back and checking out their previous album 7Ghosts.